The family comprises of 100 genera and 850 species distributed mainly in tropical and sub-tropical regions of the world. Most members are cultivated for their edible fruits. The common are: Cucurbita maxima (Kadu), Luffa cylindrica (Ghia tori), Cucumis sativus (Cucumber), Citrullus vulgaris (Water melon) and momordica charantia (Karela). Herbs with weak stems tendril climber, simple leaves of palmate type, flower unisexual, epigynous, calyx 5 united, corolla 5 to many, stamen 5, tricapillary, syncarpous, unilocular, inferior ovary. Habit: A tendril climbing herb cultivated for its edible fruit used as vegetable. The plant is monoecious bearing unisexual male and female flowers. Stem: Weak, hairy, herbaceous, juicy. Leaf: Cauline and ramal, alternate, exstipulate, petiolate (petioles long), simple, reticulate, multicostate, leaf lamina palmately lobed (4 – 7 lobes). Bracteate, pedicellate, incomplete, actinomorphic, unisexual, pentamerous, staminate. Calyx: Five sepals, gamosepalous, campanulate, superior. Corolla: Five petals, polypetalous, campanulate, superior. Androecium: Five stamens, four united in pairs and one free, sigmoid, superior. Gynoecium: The gynoecium is absent. Floral Formula: K(5) C(5) A1+(2)+(2) G_-0. Pedicellate, incomplete, actinomorphic, epigynous, unisexual pistillate, pentamerous. Corolla: Five petals, gamopetalous, campanulate, superior. Androecium: The androecium is absent. Gynoecium: Tricarpellary, syncarpous, ovary inferior, and unilocular with many ovules, placentation parietal, style cylindric, stigma trilobed. Floral Formula: K(5) C(5) A(0) G(3). 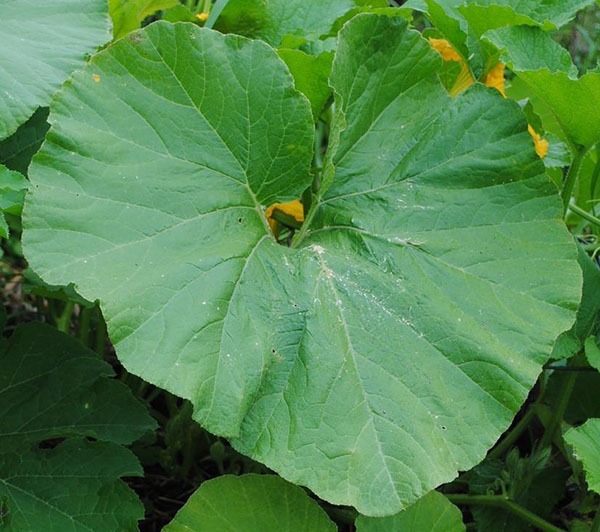 The floral diagram of Cucurbita maxima is as given below. 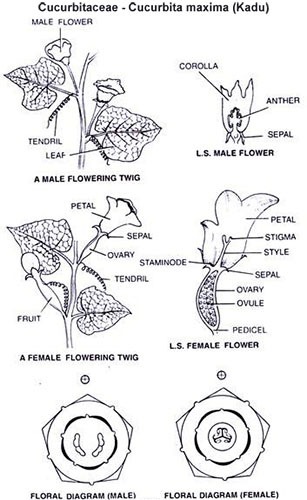 The diagram is showing a male flower twig. along with female flower twig. At the left side is the L.S of Male flower and below it is the female L.S. 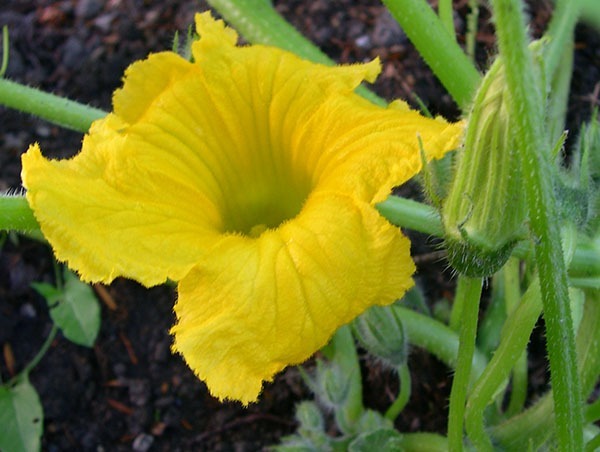 Below as you see is the Floral pattern of Cucurbita, how the the petals sepals are arranged.